Finally! 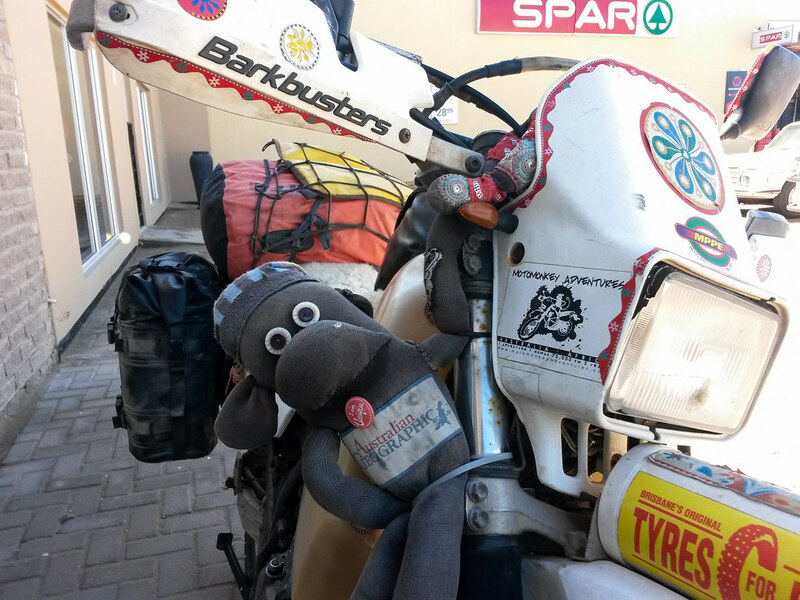 Normally packing and loading our bikes is a chore, but this time I am enjoying it one hundred percent as it means we are leaving Swakopmund! We managed to hit the road around 9am, heading north along the coast riding causally at 80 kilometers per hour. The road was constructed of salt but felt firm and smooth under my tires. In fact it felt as if you were riding on ordinary asphalt. 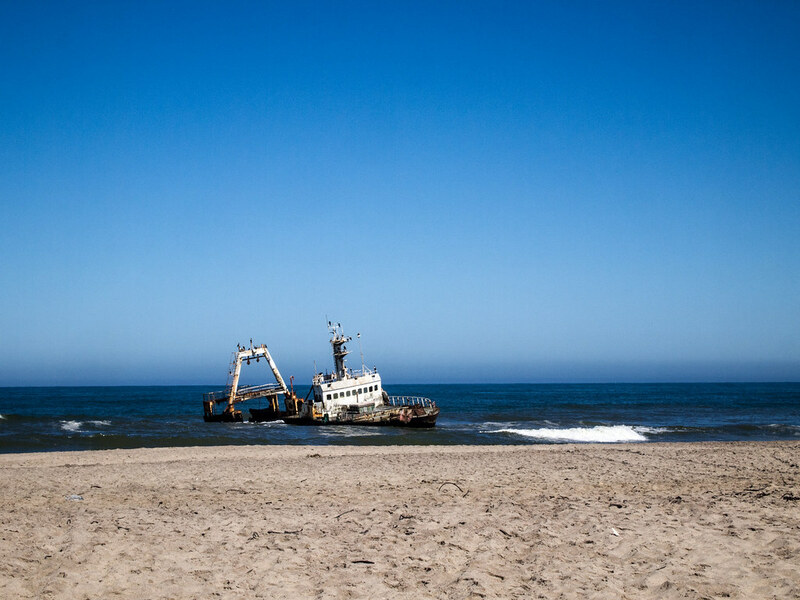 Not far out of Swakopmund, we stopped in to look at a shipwreck, half submerged under the high tide. As soon as we parked the bikes, Mike was getting hounded by tourist touts trying to sell him precious stones while I took some quick mementos. Just before lunch time we arrived at a village, on the coast, we needed to pick up some groceries and have an early lunch before we headed inland. As we walked into the quaint little tea shop, you could see the owner’s eyes light up at the sight of us. We sat down in front of a window to get a good view of our bikes. There were plenty of people interested in us, but none of them inappropriately touched our bikes. As we were getting ready to leave, I noticed someone had put a cute little red badge on both of our sockmonkeys. The badge read “I Am Unique”. I smiled, that was very thoughtful of someone! 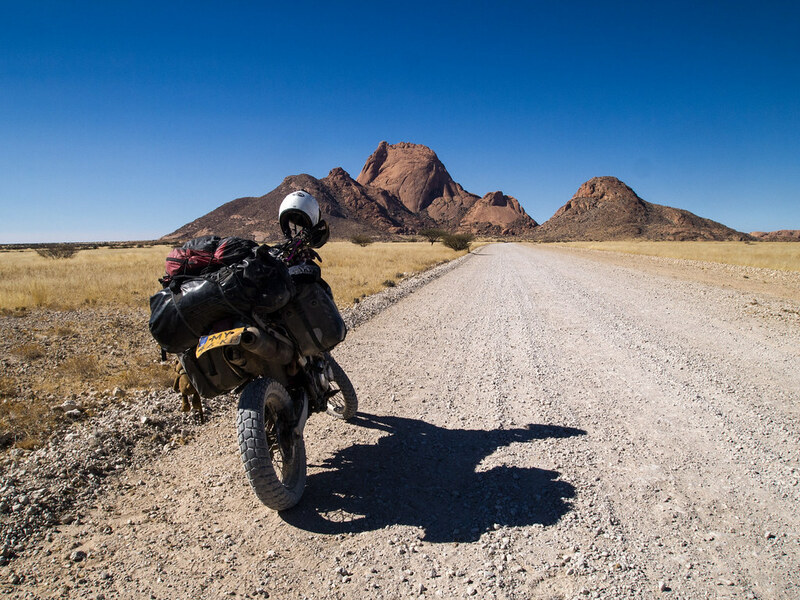 From this town we turned inland, following what Namibia calls a “D” road. On the horizon, you could just make out a small hill. As it grew, I knew that was where were heading for the night, there was no mistaking it! As the mountain grew, so did the temperatures. 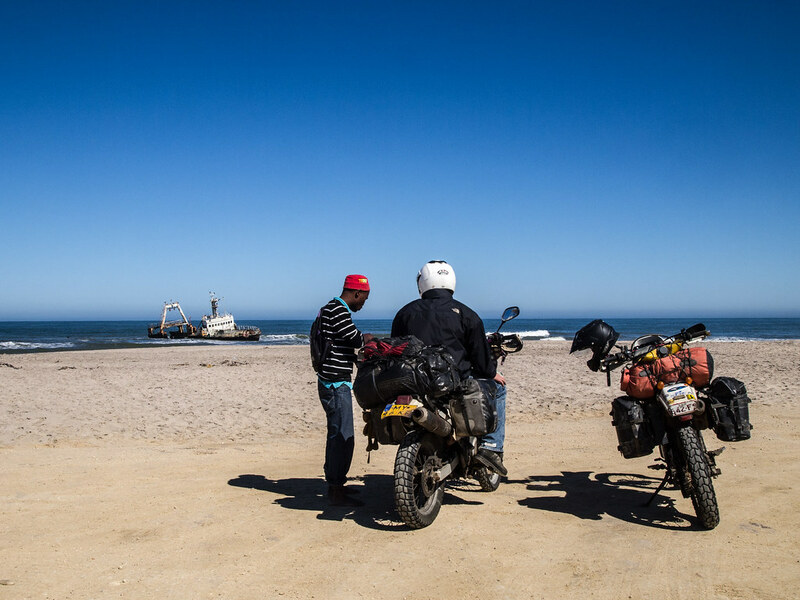 After seven long cold weeks in Swakopmund, it was sure nice to feel the sun heat up your skin, after peeling off all the layers of winter gear. 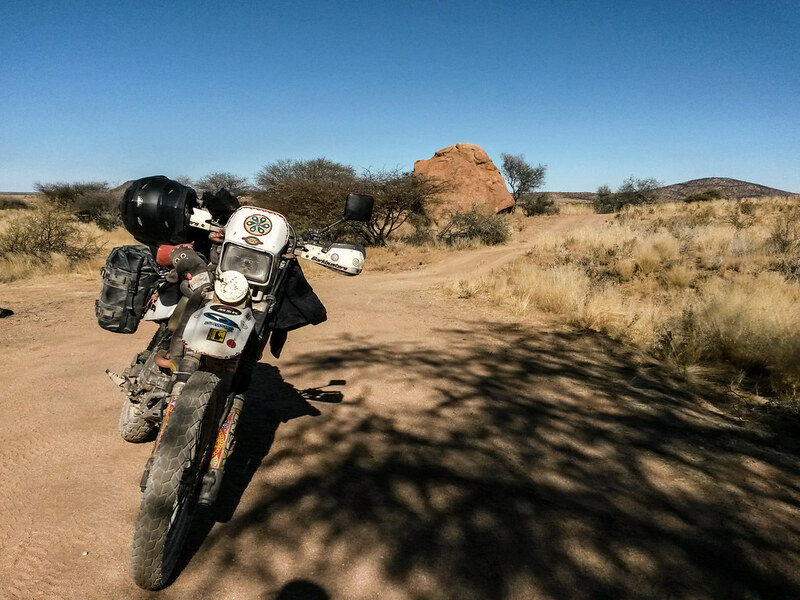 Eventually we came to our turn off onto yet another smaller road that would lead us directly to Spitzkoppe, through the backway. With the road conditions slightly worsening, we pull over to let tourist in a rented four by four go past. I really hate it when people don’t give you enough room when riding on unpredictable roads. Who knows what can happen. These people quickly became annoying, they went through a farm gate, looked up and saw we were only several meters behind them but still closed the gate on us. On one hand, I am happy they did that as it’s good practice, but on the other hand he could have waited a few seconds as we rode through. 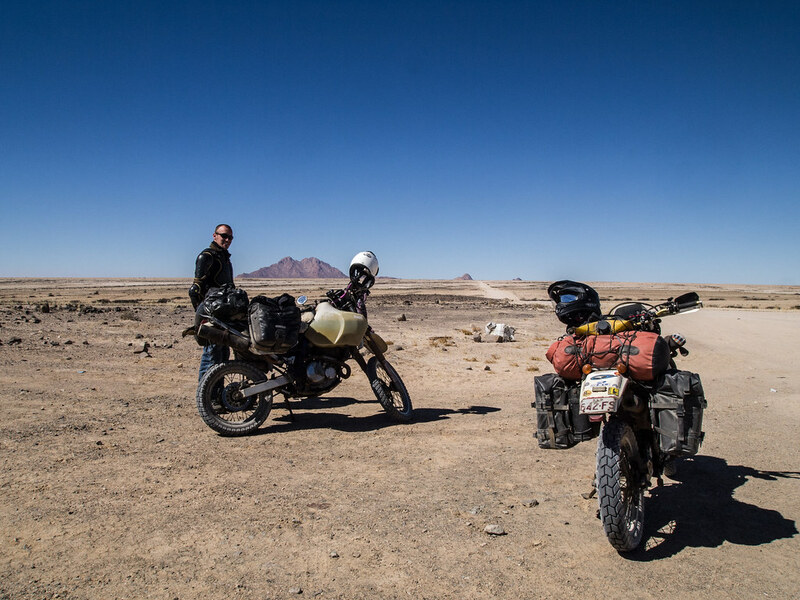 Further down the road, they pulled over to take pictures of the Spitzkoppe mountain that now towered above us. Mike rode past them. Then as I was about to pass, they decided to pull out on me.”Ugh! What are you thinking? !”, I semi-scream to myself, “Now, you want to split us up!” I slowed down to let them take the lead, then they changed their mind once again and let me go past, with a friendly wave. These people were dangerous, not intentionally, but just out of carelessness. We got clear of them and gained a little bit of distance. Then it was our turn to take a break and grab a drink of water. They passed us slowly and I just hoped it was the last time we would meet them on this road. After our cat and mouse incident, we followed the road, right up to the base of the mountain we had watched growing taller all day. Then the road folded its way through between the golden stone mountains, and large smooth boulders. It was so beautiful. I kept one eye on the road and one looking all about me. Eventually we found the reception and were given a beautiful campsite for the night, far away from everyone else. Most people go for hikes up to the arch or go rock climbing here. The famous arch was 5 kilometers back and in this heat we would need a ton of water to even walk there! 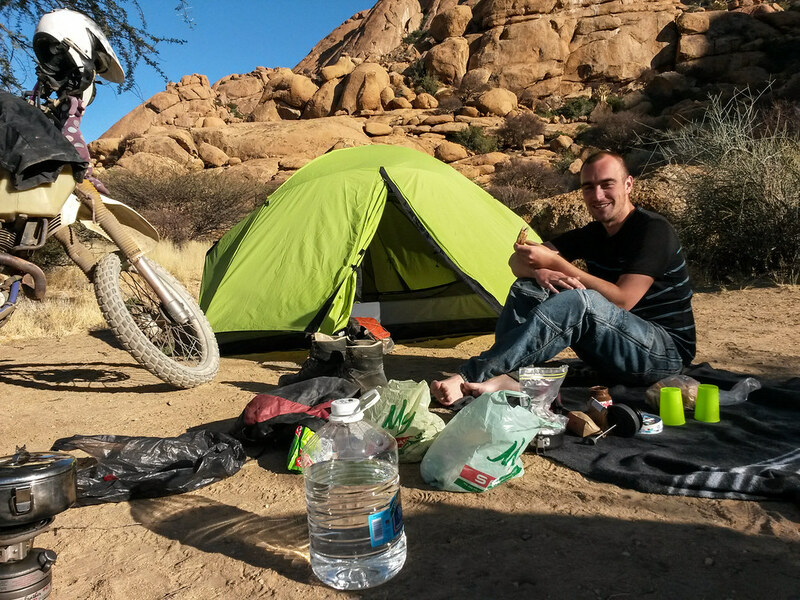 We really didn’t want to unpack our bikes so we decided to just enjoy our camp and its environment. 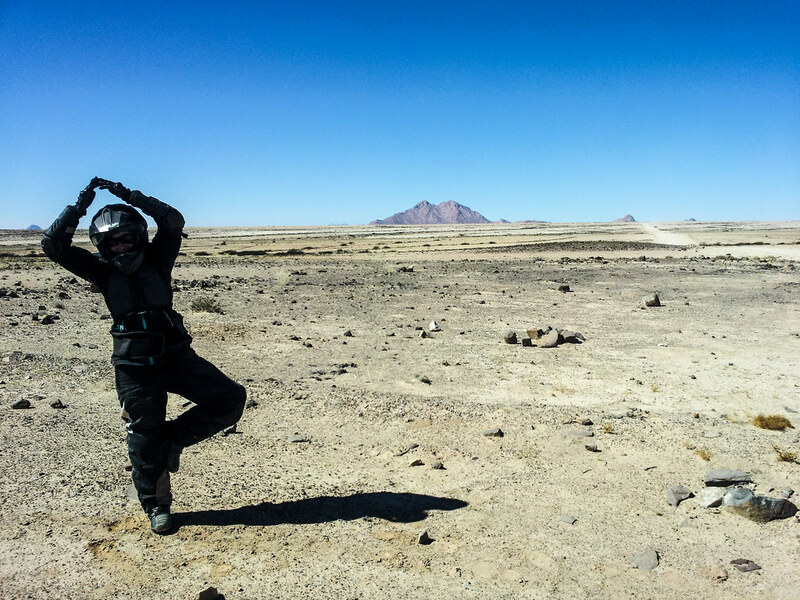 In the morning we rode on a nice gravel road until it met up with the main highway, and from there we drove into Windhoek, the capital of Namibia. Hahaha – I know right, we should have done more there! At the time we were planning on coming back. It would have been lovely to have had a few days there and go to the arch. Does it remind you of doing a 4 hr drive in Qld to have a drink at the pub, then drive back again? Perfectly sensible!